"To Go or Not To Go"
Traversing Serbia from north to south was the big question mark on our 2005 itinerary. An ongoing challenge for Map Man has been finding a safe way south from Austria to Turkey as there are so many poor or recently war-ravaged countries in between. We'd love to go along the Black Sea, but worry for our personal safety when traveling on the back roads in some of the countries. We constantly inquire about how Bulgaria, Rumania, Albania, and Serbia are progressing as places to be for tourists from anyone we meet that might have an informed opinion. Every year the reports come back better but still with worrisome reservations, expect for Serbia. Despite being bombed by NATO in 1999 to prevent further aggression in Kosovo, Serbia has been regaining respectability in the travel industry. 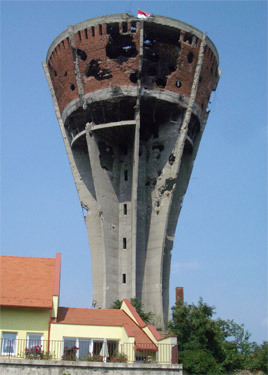 Serbian handiwork on a Croatian water tower. But the assurances from a Bradt guide book published in 2005 and a check with the American Embassy in Slovenia didn't dispel our apprehensiveness. Croatian abuses towards minorities are what triggered the domino effect of atrocities in the Balkans in the 1990's, but having traveled along Croatia's pleasant and touristy coastline in 2001, we'd always felt more affinity for Croatia than the unknown-to-us Serbia..
Map Man fretted about accommodation availability and wondered if we'd have to hop a train to find lodging part way through the country. We tried to imagine if we'd feel safe or if we'd find ourselves on a train or ferry on the Danube to escape the country altogether. In Austria, a bank was unable to quote us an exchange rate for Serbian currency to the Euro, making us question just how slippery the pricing and currency would be. Doing what we could to prepare, we stocked up on Euros in case hoteliers demanded them and bought blank CD's to backup our laptop and mailed them home as insurance against the theft of our gear. And we fretted about the Cyrillic alphabet that the Serbs use, making their language look too much like Greek to us. 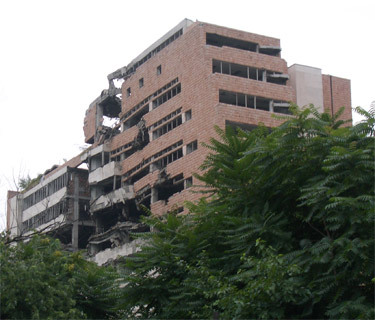 Seeing the Serbian-inflicted artillery damage to Croatian homes, businesses and infrastructure did nothing to enhance Serbia's image in our minds as we pedaled closer. The massive cemetery at Vukovar for the thousands massacred by the Serb's in the '90's only added to the chilling image. Yes, Croatia did their share of ethnic cleansing and destruction, but it was the violence done by the Serbs, not the Croatians, that was before us now. Those images combined with the sprinkling of roadside land mine signs to completely displace the peaceful, dramatic images from the tops of Dolomite passes that were vividly implanted just 2 weeks ago. We were acutely aware that we were in a recent war zone, one still filled with tension, one still unable to leave the horrors of the past behind and move forward. The streets in the last town in Croatia at the border with Serbia were completely torn up with construction work and riding and walking our bikes through the broken pavement and deep gravel only added to our agitation. The hot sun and roiling dust completed the image of hard times ahead and made it all look too much like another battle field. With minimal border formality and a short pedal on a poorly maintained bridge over the muddy Danube, we were plunked down in the small town of Bačka Palanka, Serbia. The street scene before us immediately looked poorer. The rough, dusty road and rusting metal on the street fixtures spoke of a cash short country . Pausing at the first traffic light, I spotted a horse drawn wagon making a U turn in the middle of the street ahead of us. And the residents of a dwelling to my right had recently made a fire on the sidewalk. Glass panes were missing from the windows of some homes. We took a deep breath and followed the signs toward "Center". The good news was that our Latin alphabet was included on much of the signage, though we wondered if that was a border crossing or border town phenomena. Regardless of the cause, the signs reassured us that indeed there were places to stay. We'd been riding 50-65 miles a day since leaving Zagreb because of the shortage of lodging in the war-ravaged breadbasket of Croatia and the increasing heat left us begging for a shorter day. Staying in Bačka Palanka would cut the mileage in half, helping us cope with the temperature in the 90's and the day and night high humidity. And a short day on entering a new country is always helpful in calming the nerves and getting acquainted with a new currency and a new language. We steeled ourselves and began scouting the rooms for rent as we headed towards an ATM for negotiable cash. A newly renovated hotel with air conditioning cropped up in our search and Bill's German proved useful for inquiring about the room. For $51 we could have a pleasant, fresh room that would extract us from the sweatbox of the outdoors. He leaped at the prospect of a good night's sleep, something our $73 room the night before in Croatia hadn't bought us in a room that only cooled to 80 degrees and had no barriers against the mosquitoes. Our guide books were right: Serbia, unlike Croatia, was a good value. I unfortunately felt a bit barked at by the receptionist at the hotel and had sent Bill in with the German she preferred to speak, but was taken with the friendliness of a few of the people on the sidewalk. One Serbian family stopped at the insistence of dad to talk about our "Barcelona to Istanbul" sign. He used his halting English to express how he simultaneously loved and couldn't believe the concept of our trip. I surprised myself by being able to pick-up something in his Serbian scolding of his son that was recognizable as "practice your English" and offered the text book "My name is Barbara, what is your name". The primary school lad knew the drill we had learned in Turkey several years ago and came back with "My name is...." and with nudging from mom followed with "It is so nice to meet you." His grinning preschool brother chimed in with his name too. Two young English speaking Serbian staff women emerged from the hotel and were practically in giggles to have us as guests. They inspected our bikes and gear as we unloaded and helped haul our belongings. The young woman from the marketing department adopted us and was at our side any time we paused at the reception desk. Unfortunately the town's resources were too scant to provide us with a bookstore with maps, but she was confident and eager to help support our efforts. Our first steps on a Serbian sidewalk were a near miss with a strip of freshly poured concrete. The only marker for it was 2 small sticks of wood covering a couple inches of its width. Had we not been alert, we would have coated part of our tires and fenders with gloppy concrete and messed up their handy work. The next morning I noticed several bike tread marks and foot prints left by the unlucky. Our quick stroll through the pedestrianized city core revealed the familiar sad look of other eastern European countries. The abandoned hulky, concrete department store building was begging to be torn down, though not because it was bombed like the one in Vukovar. Small shops that were open for business yet looked buttoned up lined the street. The many bikes parked or in use looked like they'd never been of good quality. Most of the people looked tired and poor. The couple of women staffing produce counters in the open air market in Bačka Planaka were eager and obliging though they and I kept speaking in our own languages to complete the transactions. Yet the 2 men in the bank looked like they were peeing in their pants when we came in to look at their posted exchange rate sheet and the 2 young men in a bar were clearly enjoying staring at us but withdrew enough to be out of speaking range. As in eastern Croatia, it was always a guess as to who would return our "dough-bra-don" greeting and who would mutely stare back with apprehension. After loading down with surprisingly lovely and cheap produce in the open air market, we headed off for the new supermarket we spotted in our neighborhood. A $1.50 got us 4 lbs of peaches and plums on the street and the slick new market also made our converted dollar go far. Frozen vegetables that had cost about $2 in Croatia were 66 cents in Serbia. Even familiar brand name products were refreshingly cheaper than we'd seen for months. And as elsewhere, it looked like the pressures of western Europe were forcing an acceptance of the Latin alphabet onto shoppers. Some of the translations into English left us wondering, like "Cloudy Orange Juice," but at least we had enough information to guess. I was stunned to see that there were 4 different Wifi signals available on our laptop from our hotel room window. The unsecured sites weren't strong enough for us to access them, but I would never have guessed that there was any Wifi in this sorry looking town. (It is an almost nightly ritual for us to scan for a Wifi connection to the internet even though we only find a usable signal about twice a month.) Our first 2 hours in Serbia left us with the impression that it is a country burdened with much that was wrong about the communist system; that it is scrambling to catch-up with the western world but sadly, it is leaving a part of its population behind in the process. Sweaty cyclist's Imme and me with our Serbian hostess. Despite our apprehension about being in Serbia, the people immediately knocked our socks off with their friendliness and outgoing helpfulness. Almost every day we could tick off another surprising act of random kindness. Our first day in Serbia was eased by the 'bend over backwards' helpfulness of the hotel's marketing person. The next day we stopped in the shade of a sidewalk tree to chat with a young German couple 4 months into their first cyclotour and the woman of the nearby house invited us all in for refreshments and conversation. "Invited in" is putting it gently as when we didn't jump at the in-Serbian invitation, she took me by the arm and guided me into her kitchen. The 4 of us obliged and did our best to communicate with her and her adult son who won't be fully recovering from his motorcycle accident some years ago. The next day in Novi Sad the young men at the bookstore offered to discuss our route through their country in detail with the aid of the map that Bill just purchased. When I lamented about the mosquitoes the clerk promptly wrote down the name of his favorite repellent. At the pharmacy, the clerk spoke some English and happily researched the ingredients to answer our questions. The tourist info staff was also extraordinarily helpful in Novi Sad. The 2nd Serbian woman who wouldn't take "No" for an answer. On the way to Belgrade a few days later we stopped in a town for our picnic lunch, carefully positioning ourselves for the maximum wind in the shade in front of the public library on the oppressively hot day. We had no sooner sat down on an empty planter box and the middle-aged proprietress of a 3-tabled outdoor cafe took me by the arm like the other Serbian woman had done and sat me down at one of her tables for us to eat our brown-bag lunch. She brought out plates, utensils, a bread knife and napkins. Then came the plate with sliced cucumbers, pale yellow peppers and a salt shaker. That was followed by flattened bread with melted cheese and seasonings. We were flabbergasted and she made it clear that she wasn't accepting any payment. We dug out a small Oregon souvenir key fob as a token gift, which she promptly turned over to her young grandson. The Serbs have a gentle but very direct way of offering their assistance. We felt like we were being approached by a family member who of course was there to help you with no strings attached. They moved into our personal space like they belonged there and yet weren't threatening in how they did it. Nothing about their manner was confrontation--it was fascinating to receive their assistance. And their offers ran deep and many were quick to follow up with additional help. We got the feeling that nothing was expected in return but that it was their habit to freely help when they could. And they did it with such grace that we never feel like we had been a burden though the help they delivered was huge to us. And in addition to assistance, people gave us little things while we were in Serbia. While picnicking in the shade of an abandoned cafe awning, a neighbor lady gave us 2 tomatoes and 2 peppers just picked from her nearby garden. Bill had been standing with the bikes while I ducked into a market in another town and the man he had been chatting with gave us a tiny Serbian language book and 2 postcards from a nearby sidewalk vendor. In a small village a Serbian man that fled to New Jersey gave us homemade pork fat biscuits from his parent's home across the street from the market where we shopped. 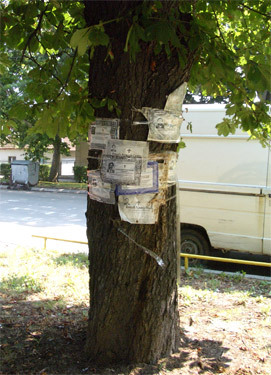 And as we ate lunch under a tree on the 'burbs of Belgrade a local woman bought us each a cup of tea from the cafe in which she and her husband were sitting. In sharp contrast to the delightfully outgoing and caring manner exhibited by many Serb's when face to face was the shockingly bad behavior by too many once behind the wheel of a car or truck. Serbia quickly moved to the top of our very short list of dangerous or "never again" places to bike that includes Paris and Poland. We expect driving styles to vary with the culture. We know that Germany represents one extreme with their very pleasant, legally codified politeness towards cyclists and at the other extreme is Italy where the drivers play a fast and tight driving game that includes a slim but reliable safety zone for bikes. But like Croatia, pedaling in Serbia was a white knuckle affair with nothing to reassure cyclists. Driving manners came to mind one morning as we anticipated visiting a former WWII Serbian concentration camp and once again pondered the human capacity for cruelty. Some of the motorists seemed to have a similar detachment from humanity as must have occurred in the perpetrators of the recent ethnic cleansing in the former Yugoslavia and in the Nazi camp staff, as too many Serbian motorists drive with a pointless malice. One gunned passed me in urban congestion--the surrounding traffic gave him no where to go forward and yet he dangerously blasted by me. Others staunchly refused to budge from their position on the road when passing us even if there was no oncoming traffic. Some sounded their horn notifying us that they were overtaking us and others honked expecting us to ditch, leaving no room for us to remain on the road. The situations in the old concentration camp and on the current roads were both reminders of how successfully people can compartmentalize their viciousness. We expect a certain number of near-misses per month when cycling knowing that everyone occasionally makes bad decisions (including us) and that situations unfold differently than anticipated, but in Serbia the driving glitches far exceeded the norm. There was a frightful viciousness exhibited by a much larger than average percentage of drivers in Serbia than elsewhere. Of course, we always wonder if such judgments are too harsh or if something we are doing is provoking an unusual response but our impression seemed validated by the large number of memorial markers along the roads. Many countries allow such markers and we are accustomed to seeing them but in Serbia we didn't see one or 2 a day or a week as we usually do but sometimes dozens in a hour. Many of the memorial markers were predictably for 20-30 year old males that we presumed were the motorists, but others for elderly couples and children who were likely pedestrians or bicyclists. Riding our bikes through Serbia demanded changing our riding styles. The roads were always narrow with only 2 lanes. Only once was there a passing lane on a hill and once we had a foot-wide shoulder for an hour or so. Often the terrain left nowhere to go off the road if things got tight, necessitating that either the oncoming or overtaking driver slow down (which was asking too much of some). We quickly shifted to riding a tighter course than usual, as if keeping the wheel on a painted line 100% of the time. That is incredibly tedious riding but it was what we had to do for hours on end for many days while riding south through Serbia. In Serbia I also learned to interrupt my habit of constantly looking in my rear view mirror as it was just too frightening. I learned instead to avoid looking in my mirror if a tight situation was developing as the very most important thing for me to do was be absolutely steady on the road. My attention was riveted on the often broken pavement and all of my focus was on navigating. Normally I'd factor in what was happening behind me, but with nowhere to go, it didn't matter--all I could influence was the tracking of my bike by keeping my eyes glued forward. 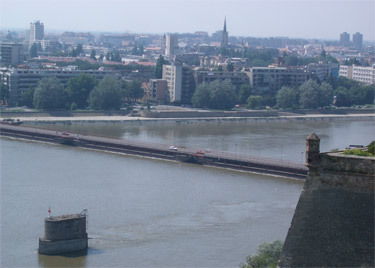 The cash-cow pontoon bridge in Novi Sad. Novi Sad was the first of the 3 major Serbian cities we visited and the tourist brochure's descriptions as "Serbia Athens" and "Danubian Gibraltar" were lost on us. The pedestrian streets were torn up for new pavers making it hard to walk around; disappointingly, the finest pieces in their museum--2 gold Roman ceremonial helmets--were in the basement for year's of restoration; and we barely slept at night with the difficult triad of heat, humidity, and mosquitoes. We stayed at the same regrettable place as the German cycling couple we had met on the way into town, which added a bright spot to the difficult time. The best part of our experience there was in taking breaks from the heat in their nicely kept city park that had a few lush green areas. Some weeks after leaving Novi Sad we learned a revealing bit about it from a Dutch couple we spoke with while in Turkey. The bridge in the photo is a temporary pontoon bridge installed after NATO bombed the bridge of which there is a piling shown in the foreground. This low bridge blocks water traffic on the Danube and it is only opened 3 times a week at night to allow boats to pass by the city, charging each boat a hefty fee based on their weight for the privilege. The new bridge is completed but the contractor can't quite bring himself to turn the bridge over as he is making more money off of the tolls he collects 3 nights a week than he loses in fines for being late in completing the project. Now this kind of skullduggery is hardly unique to Serbia but it does nothing to improve the country's tarnished image in the region. Despite our immediate warm reception in Bačka Palancka and string of other friendly encounters on our way to and in Novi Sad, Serbia was an unsettling place. The typically eastern European, dreary gray communist-era buildings tinged black with pollution made us wince as we did the first time we saw them in Czech Republic. The roads and sidewalks were buckled, sunken, cracked and twisted. 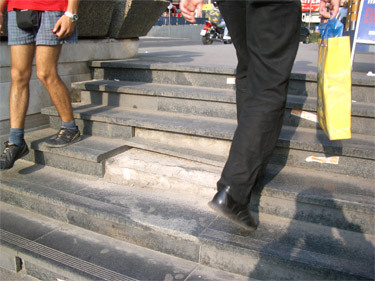 Staircases in public buildings had to be traversed with care as parts of steps were often missing. Indoor stairs were occasionally narrowed by metal plumbing snaking across one tier. Modern buildings whose windows were becoming opaque from the now permanent stains from the leaching of adjacent building materials were a common sight. Clearly window washing wasn't a compulsion as it is in Central Europe. The main maintenance activity we saw in town or along the roads was the cutting of grass and in a country in such desperate need in so many ways, grass cutting seemed like an odd allocation of public resources. Not surprisingly, we saw few flowers planted in public areas or homes in Serbia. And too many people had the dusty patina I associate with homeless people yet I suspect they had homes but live without running water. Ever-watchful for the missing steps in Serbia. Historically, Serbia was always #3 on the economic ranking of the 6 republics within the former Yugoslavia. It always has and continues to trail well behind Slovenia and Croatia economically and to our eyes, it looks more like its more distant former communist neighbors Hungary or the Czech Republic. Its 'average' performance in the former Yugoslavia was degraded by Miloševič who was president from 1989 until 2000 and is currently being tried as a war criminal at The Hague. The economy was shattered by war as he struggled to counter the break-up of the federal state in 1991 and then by almost a decade of sanctions. Living standards were reduced to almost third-world-style poverty. In the mid-1990's, inflation was the world's highest ever, running at 3% an hour (compared with the 3% a year that worries economists in most countries) or 600,000%. The young and well educated left the country in droves, some in fear for their lives. Now it is saddled with 500,000 or more refugees and internally displaced persons, with the later category often not qualifying for aid on technicalities. I heard the words in my head "Nothing works right here" and yet it isn't true--things do work, but they are in a sorry state by western standards. But it's challenging to put places like Serbia into perspective. Serbia looks good compared to the plight of the masses of Ethiopians living in the 3000 year old Iron Age culture recently featured on the BBC, and yet it looks like a loser even when compared with some of its former Yugoslav neighbors. And many of the old vehicles we saw struggled. On the road to Belgrade one aging commercial truck was creeping up the 4% grade hill slower than we were pedaling. Much to our surprise, the modern looking trucks coming down the other lane weren't going much faster. Bill guessed that they lacked the disc brakes needed to control their heavy loads as all of the truck traffic crept at a snail's pace on the grades. In addition to the aging vehicles, there were hundreds of "Vulkanizer" signs advertising the re-treading of tires. 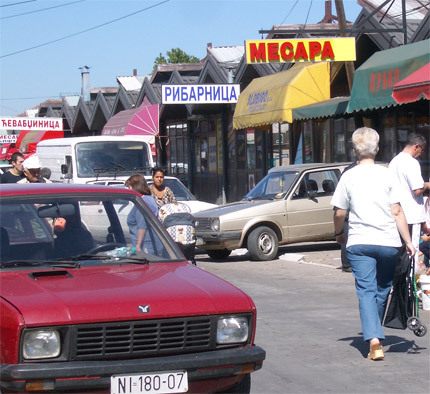 We wondered how they managed to keep the wide array of old vehicles in parts but learned that a huge Sunday market in Novi Sad was the place in the country to buy cannibalized parts for any need. The hard times were underscored by nearly motionless people scratching out a living as small, curbside retailers. The summer's fresh watermelons, tomatoes and peaches could be found for sale on many a street corner. A folding fan I happily paid $1.50 for in Croatia could be bought for 43 cents in a Belgrade passageway. The resellers that seemed to lack connections or the physical ability to handle food products were selling the convenience packs of 10 tissues on the street--tissues that are the essential when using public toilets in Europe. One man's regular occupation seemed to be staffing his assortment of 10 used books for sale, some in English and others in Cyrillic. After seeing his pitifully outdated 1997 travel guide of the UK in English I was sorry we didn't have our 2004 Italy Lonely Planet on hand to add to his inventory. A number of Serbians we spoke with lamented the loss of their country with the break-up of the former Yugoslavia even though it was Miloševič and other Serb nationalists lobbying for a greater Serbia that terrified the other republics. But these Serbs fondly viewed the runaway republics as part of their lost homeland and that the country they loved was now destroyed. We longed to hear more from the couple of 20-something Croatian and Slovenian women currently in Serbia that moved to Serbia before the break-up and now were kind of stuck. 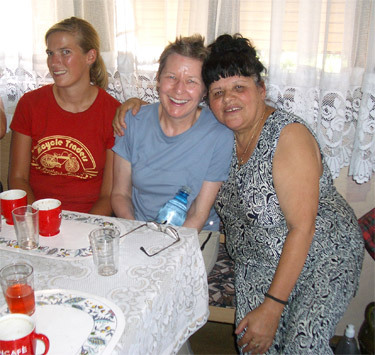 One certainly felt like an economic captive in poorer Serbia and the other woman's English skills weren't up to sharing the details of her story. It didn't take too long for conversations with several others to digress into discussions about the economic woes of Serbia and their hopelessness about seeing much change in their life times. One young woman spoke of being overwhelmed by the paperwork required to immigrate to Canada and hoped at least that life would be better for the next generation. A museum professional added how repelled Italians were to hear that she was Serbian on her recent visit to their country. Not only do many Serbians feel trapped in an economic mire but they also bear the burden of being from a pariah state when they travel.
. The written words in Serbia that were translated into English in museums and brochures were often tinged with "If only they hadn't done this to us..." and "We would have if they hadn't...." The civic museum in Novi Sad was awash with "ain't it awful" and defensive justification for why things hadn't worked out in northern Serbia over the centuries. In Belgrade, we became suspicious that its twist was "We've almost got it" as in the internet shops we were told things like it was "only today that the system was slow" and that they'd "have cables for connecting laptops in a few days." We couldn't help but think these were face-saving lies when they were delivered. The tone in the tourist info brochures in Belgrade also had a twisted quality. Published comments like those about the Roman Well: "the well is actually Austrian, but we think it more elegant to call it Roman; and that the "1972 Bobby Fischer-Spassky chess championship match should have been held in Belgrade instead of Reykjavík but wasn't" continued this shell-game view of events. This "almost but not quite" written viewpoint was in sharp contrast with the direct contacts we had with Serbs. Each of our first 4 days in Serbia were punctuated with conversations with competent English speakers being quite direct and blunt about the political and economic woes in Serbia. Their comments weren't defensive or blaming but matter of fact about how things have been recently and are at the moment. These were people at hotels, bookstores, and tourist info offices. As if the shocks of seeing the Serbian challenges weren't distressing enough, we discovered that just by being in Serbia that we were tainted as international consumers. In the process of trying to sign up for the internet telephone service "Skype", we got caught in a Catch-22 that must go on all the time for people from these eastern block countries. Credit cards weren't allowed for making the on-line purchase while we were in Serbia or later in Bulgaria, even though we are US citizens with US credit and debit cards. 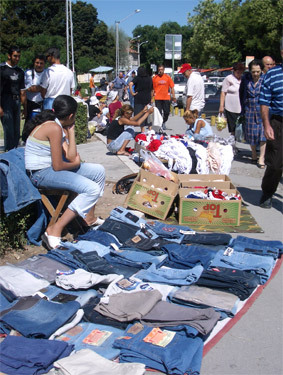 To make the purchase while in Serbia, we had to use a special escrow account for payments. We were already set-up with one account in the US, but could only use one that was new to us: Moneybookers. After many sessions at internet shops, an email to our bank, several emails to Moneybookers, and a long distance phone call to them over a period of a couple of weeks, we gave up. The safeguards built-in to their system made it impossible for us to make this $12 online purchase until we arrived in Greece and could again use our credit card. The first days in a new country are often a little shocky and then the difficulties of the newness dissipates and everything gets a easier. But not so in Serbia--even after a week it still gave us both the creeps. It was so tattered and life here looked so grim that it made us pull away. We both started having troubling dreams about food and lodging even though we hadn't had any particular problems with either. But the setting was glum enough that it seemed to be triggering survival worries deep inside of us. And it was in Serbia that I began wondering if looking more closely as we travel to support my writing wasn't backfiring as in Serbia the feeling state was already intense enough. A part of me would rather have been looking away rather than scrutinizing sorry looking cityscapes to understand what made them look so bad--a little breezier look at this country would have made it easier to handle. The Cyrillic alphabet and Serbian language left us clueless. Bill kept verbalizing things like "What will it take.... How will they ever.... Where do you begin...." Were Serbia a house on the real estate market, it would be a "fixer-upper" but one that might best be leveled for starting afresh. Like the other eastern block countries, it suffers terribly from neglect, from lack of maintenance. But unlike its northern compatriots we've visited, there aren't any bright spots. In other countries we can easily recall oases of delightful: buildings or corners of towns or villages that gave relief from the look of disrepair and grayness. But Serbia was short on any public space refuges for our eyes--every thing our eyes landed on was in a sorry state. The only relief from the grimness was by stepping into the occasional retail space that was recently renovated, when we could find them. Hundred degree days, hot sticky nights, hot flashes, roaring allergic reactions to too many mosquito bites, and my first bout with hemorrhoids made the challenges of being in jolty Serbia even greater for me. Bill's heat frazzled mind was torpedoed by a misbehaving laptop computer, multiple futile attempts to connect to the internet, and poor quality road maps for route planning. Arriving in the Belgrade area meant we had left the semi-autonomous region of Vojvodina behind and now the street and road signs were almost all in Cyrillic and yet our 2 guide books were giving addresses and town names in our Latin alphabet. We still managed to be polite to each other but longing for better times, we rode to Belgrade one sunny and sizzling day fantasizing about finding a Motel 6 clone close to the city with air conditioning at prices below the $120+ that would be required in Belgrade to be cool. We couldn't believe our luck when we found a newly renovated place right on our road that was 5 miles from the city center at the end of the long riding day. It was half the city center prices and with public bus service to town every 10 minutes outside its door. And our timing was excellent as the next day the heat wave peaked at 104 degrees. 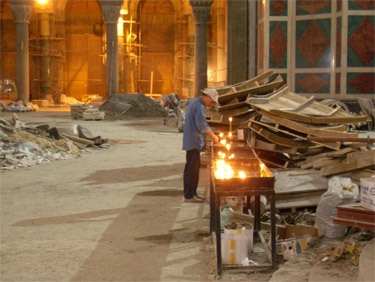 A construction worker tidies up the candles inside the church. We resolved to bask in our good fortune and stay an extra night in our almost mosquito free, air conditioned room in the Belgrade 'burbs while the worst of the heat wave peaked and we restored our sense of well being. Our problems wouldn't all be solved with an extra layover day, but it was all we had to work with to ease our frustrations and recurrent feeling of "It's too hard." Visiting Belgrade only reinforced our impression of Serbia as being a country in tatters, a place of what was or what will be but not what is. The Belgrade folks compare their prized Kalemegdan Park to London's Hyde Park. Perhaps it is as dear to the hearts of the Belgrader's, but it didn't even measure up to the city park of neighboring Novi Sad in my eyes. Its setting by the confluence of the Sava & Danube Rivers is impressive but seems to have had as troubled of past as the adjacent fortress which was destroyed and rebuilt 40 times in over 2,000 years. It's "life as usual" around the buildings NATO bombed. There wasn't all that much to see in Belgrade, especially since their prized museum was closed for much needed repairs. But the high heat and persistent humidity had us sightseeing at a snail's pace. Each day's outing was a study in walking in the shadows and under awnings to avoid the direct sun and we repeatedly extended our stay an extra day because of our slow progress. After being so unimpressed with Belgrade, I was feeling a bit guilty that we didn't take the time to visit the monasteries in the surrounding hills with their old frescoes as they are a great source of pride to Serbs. These monasteries built from 1100 to 1400 proliferated as successive rulers displayed their power and represent Serbia's Golden Age. Luckily we discovered the "Gallery of Frescoes" in Belgrade that has exact copies of many and a few originals. Seeing the specimens in the gallery reassured me that we'd made the right decision: they don't represent an area of interest to me and the samples we saw satisfied my need to know. 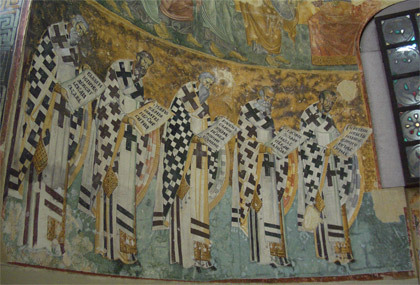 One of the more complete monastery frescos in Belgrade's Fresco Gallery. The chance timing of our prolonged stay in Belgrade looked well informed in hindsight as the day we finally hit the road again it was threatening rain. We had coasted through the last of the heat wave being able to sleep at night and reveled in the Portland-like overcast skies and occasional drizzle for the next 3 days. Never before had such gloomy weather felt so good. Every cool day that we could eek out of August would be a boon for our summer's riding comfort. We felt better in the cooler weather but our hearts still ached for the Serbs as so many are living such difficult lives. A part of me wanted to stop and help the old woman pulling a small trailer with gallons of bottled water to her home or lend a hand to the old man shuffling between towns balancing a long piece of lumber on a tired bicycle, yet there was little we could do to lessen the weighty loads of their lives. These were their normal routines, this was their lifestyle, not a crisis situation where a timely intervention would make a difference. And we felt even more helpless in seeing several generations of a family with the same grim expression chiseled into their faces--expressions that made it easy to imagine several different stories of what they had been through or were living with. Several layers of obituary notices. We hurt for the people and for the many hungry stray dogs and cats out on the roads. Serbia is not a third world country and yet there was much to make us wince. In Croatia the look was of a people working hard to 'move on up' but in Serbia it looked like the achievement was to be moving at all. In Croatia many of the homes were newly constructed though most are incomplete. Some put in their landscaping before the exterior work was done and many appeared to remain incomplete for years or decades. In Serbia there were more old homes tumbling down than new ones going up. Occasionally we saw a newer home that looked like everything worked, but more often than not the homes were in serious disrepair. Even though we were traveling in early August, few homes had any flowers to offer some cheer. The tradition of posting half page obituary notices that looked like a certificate of merit form on trees, lampposts and homes underscored the grim side of life. Spotting the nationality on car license plates became an obsession as we traveled farther south in Serbia--we estimated seeing around a hundred foreign plates a day on some days. Seeing a dozen foreign plates in a day usually means we are approaching a real tourist hot spot in Europe but on the potholed back roads of Serbia they told a different story. In one area the vast majority were Austrian with a sprinkling of German, French, Swiss and Swedish plates (and we go months without seeing a single Swedish license plate). After a few conversations we were confident that these cars all belong to ex-pats--people who left Serbia during the wars in the 1990's and were back visiting family on their summer holiday, like we had seen in eastern Croatia. We also learned that 1 person from a village that established themselves elsewhere in Europe would create a conduit for more and more people from that village to settle in their new country, which accounted for the clustering of the foreign plates we would see in the villages. Traditional marketing of modern goods. Niš was the third of 3 largest cities in Serbia we visited and it was a pleasant surprise with its attractive open plaza in its compact city core flanked by an old fort on a river. We had recoiled at Novi Sad's torn-up urban center and were unimpressed with Belgrade and once in Niš had to wonder how much the weather influenced our experience. It hit 104 our first day in Belgrade and had been working up to that in Novi Sad. In both cities we walked slowly and carefully routed ourselves from shadow to shadow to avoid the direct sun as much as possible. In contrast, Niš was in the high 70's when we arrived and the next day it rained. After quickly hitting the high points in Niš--a small WWII concentration camp and a tiny Roman ruins site--we took an extra day and a half for route planning. That's an activity Map Man usually crams into his evenings but the conflicting information about the relative safety in traveling through Skopje, Macedonia or Sofia, Bulgaria was too much to untangle on the fly. Either route would get us to our next big destination--Thessaloniki, Greece--but we just couldn't decide which route to take. We were being advised to skip Macedonia in favor of Bulgaria as soon as we arrived in Serbia. Vague references to "struggles" and "The Albanians" left us content to accept the local wisdom even if we couldn't read between the lines. Based on those biases, we assumed we'd go through Bulgaria though we kept asking about both routes. Many people also commented: "Everybody going to Turkey goes through Sofia from Niš." Upon arriving in Niš Bill learned that the "everybody" included all of the truck traffic going between Turkey and Europe, which is substantial. The situation on the road sounded grave when we realized that the freeway that had been adjacent to our little road since Zagreb, Croatia ended in Niš. We cringed at the thought of sharing our marginal road with all of the international truck traffic being diverted off the freeway. Even the US State Department was alerting motorists to the dangerous and heavy truck traffic on the narrow 2 lane roads. Our nerves were already frayed from the light to moderate truck traffic on the modest road in Serbia north of Niš, but it sounded like it would instantly go from bad to worse. We had postponed making the final route decision until we arrived at Niš, trusting that the quality of information usually improves as you get closer to a site. But the tourist info folks in town didn't seem to get out much and we took no comfort in their assurances. The US State Department's lack of concern about Macedonia was reassuring but Bill's confidence in that route was completely undermined by the equivalent information site operated by the Brit's. Their site had specific warnings about recent shootings and random violence in a couple of towns on the Serbian part of our route into Macedonia and warnings about land mines that no Serb had acknowledged as being an issue in Serbia. It's always hard to make decisions when you don't have enough information so we again poured over what we had. Our Lonely Planet viewed Macedonia as "a real treat for travelers" and expressed no concerns about safety issues. But careful reading revealed that there wasn't much in Macedonia that was a big draw for us. Monasteries, pleasant open spaces, and good night life weren't enough to compensate for a lawlessness risk higher than anywhere we had traveled. Many people we queried had said that Bulgaria wasn't as pretty as Macedonia and the consensus was that traffic was substantially worse going into Bulgaria. Bulgaria didn't sound like a winner but continuing through Serbia to Macedonian sounded like a loser. We again lamented that one of our earlier fall-back plans, which was taking a boat on the Danube out of the region, wasn't an option. For some unknown reason there were no longer public boats plying the water ways in this area. We'd fretted about going to Serbia, had found it to be a generally distressing country to be in and now even trying to exit it was difficult--but more about that in our next update. About a month after leaving Serbia we were fascinated to learn that a Dutch couple sailing along the Danube through Serbia to the Black Sea had a similar experience to ours. They too embarked on their journey from western Europe in early April and they too found their trip increasingly difficult when they reached the borders between Croatia and Serbia. The hard feelings between the two countries results in piles of paperwork for people traveling by boat. Services for them began deteriorating after Belgrade and instead of being fun, their life on the boat became too hard. Gone were convenient moorings and their associated services. Gone were nearby villages to explore and aid in reprovisioning. "Never again" were their words about the Serbian and Romanian legs of their trip. Life on this trip that they had planned for years became too much of a struggle in the Balkan Peninsula. This couple was traveling on the waters in their boat and we on the roads on our bicycles and we all came to the same conclusion: the rewards of traveling in Serbia weren't high enough for the difficulties encountered, at least by alternate transportation. If you are a museum buff and are drawn to Serbia, consider postponing your trip until 2007. By then the Museum of Vojvodna in Novi Sad should have its treasured 4th century gold Roman ceremonial helmets back on display and the highly rated Belgrade Museum that is closed for renovations should be open again. And if you are a 'birder' you might do some research before you go as UNESCO has listed a Serbain orthinological station with 240 species of birds. If you would like more of the nuts and bolts details about traveling in Serbia, click on this link (Serbia Details) or click on the homepage side bar "Country Details" and then on "Serbia". There you'll find more about prices, hotels, internet access and our shortcut way of learning enough of the Cyrillic alphabet to get by, plus several useful websites for the prospective traveler. We are in Turkey after having extended our travels here in lieu of flying to Australia and New Zealand. Flying with the bikes from Europe to 'down under' was prohibitively expensive as we would pay excess baggage charges on about half our gear. Flying from North America triggers more generous baggage allowances, so we'll fly home in early December and plan our Austral-Asia trip for a year from now. We made it to Istanbul, which is where we planned to depart from for New Zealand. Bill is still scrambling to develop a Plan B, but the early stages of that plan included heading southeast along Turkey's coast to visit the many sights between Izmir and Bodrum. We are now in Aydin after detouring inland to see the travertine rock formations of Pamukkale and are now heading back to the coast near Ephesus. We expect to be in Bodrum in about 2 weeks. Next we'll visit some part of Greece and we'll be in Frankfurt on December 4th. There continues to be a big hole in our plans from about November 1 until early December.